CRC Press, Boca Raton, U.S.A.
Review published in IJPE, Vol. 7, No. 6, November 2011, p. 524. At least 98000 People die in hospitals each year in U.S.A. alone due to medical errors that could have been prevented. Medical errors include improper transfusions, surgical injuries and wrong-site surgery, restraint-related injuries or death, falls, burns, pressure ulcers, and mistaken patient identities. High error rates with serious consequences occur in intensive care units, operating rooms, and emergency departments. These errors are estimated to result in total costs (including the expense of additional care necessitated by the errors, lost income and household productivity, and disability) of between $17-29 billion per year in hospitals nationwide besides loss of trust in the health care system by patients and diminished satisfaction by both patients and health professionals. Therefore, the claim of the editors of this Handbook is justified in promoting the design of safe, effective, and usable medical devices. Undoubtedly, this Handbook is a single source of authoritative information to support design and evaluation of medical device user interfaces and can be used by all engineers, designers, manufacturers, and specialists involved in the area with particular emphasis on human factor based designs and engineering which may eventually result in an effective and user friendly interface designs that also conform to Association for the Advancement of Medical Instrumentation (AAMI) standards. The design guidelines can be used to develop products requirements by the developers. All chapters have been designed to stand alone with a large number of figures, pictures and tables. Each chapter is appended by resources and references. The reviewer has no hesitation in saying that this 821-pages Handbook constitutes the most exhaustive and complete coverage of the subject material and would make a useful resource book for all involved with the medical interfaces and instrumentation. In general, the book would be very useful resource for medical practitioners, researchers, engineers particularly for those dealing with design of medical equipment particularly with human factors engineering considerations. 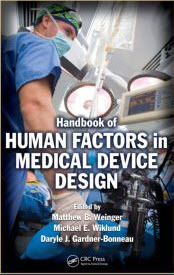 The students and teachers pursuing human factors, particularly, in improving the quality, reliability and safety of medical devices will find this book of great interest. Review published in the International Journal of Performability Engineering, Vol. 7, No. 6, November 2011, p. 524.